Securities and Telecommunications Engineering specialists, Osprey Technologies recently unveiled a new Visual Identity created by leading Lincolnshire-based design consultancy, JWDC. Osprey’s core area of operations focuses on targeted opportunities in selected countries including the United Kingdom, Africa and the Middle East. The company delivers turnkey solutions for customers’ critical national infrastructure and business critical systems’ needs. Though the choice of pictogram may not be altogether surprising, given the name of the organisation, careful consideration was given to the way in which the Symbol was rendered. 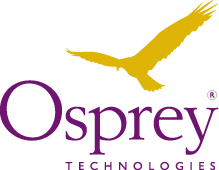 Wanting to ensure the Visual Identity was wholly unique to Osprey Technologies, JWDC, researched all manner of different sector companies trading with the word ‘osprey’ to ensure we were as exhaustive in our research as time & budget allowed. The final silhouette was crafted atop an open-source photograph of an osprey in flight to ensure accuracy of key details such as the beak, wings, wingtips and body leaving no doubt as to the identity of the bird in question. A colour palette of Purple & Yellow Ochre provided a regal gravitas to the overall identity. Upcoming requirements will see JWDC develop a Phase One Website and Stationery Suite to accompany the launch of the new Visual Identity.